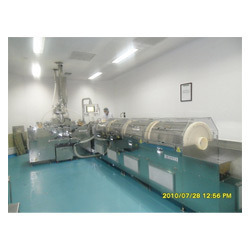 We are recognized as the foremost trader and exporter of an optimum quality array of Softgel Encapsulation Machines that is most popular machine being manufactured by Bochang. The offered machine is manufactured by our vendors at par with the set industry standards using optimum quality raw material and advanced technology. Durability, user-friendliness and longer working life are some of the attributes that make this machine highly demanded among our clients. Vedic Pac Systems Pvt. Ltd. exclusively represent, in India, several world class European manufacturers making equipment for the Confectionery, Chocolates, Food and Healthcare/Pharmaceuticals sectors. Vedic supplies, installs and provides after sales service for these state of the art equipment all over India. Our professional team works in close co-operation with leading European equipment manufacturers to understand the needs of the customer, make suggestions, and assist them in finding and ordering the machinery and systems that best suits their requirement and application. We assist them in installation and after sales service. Our customers include leading names such as ITC, Cadbury, Nestle, Ranbaxy, Cipla etc.